We all have goals we want to achieve in 2015. If you are human, you probably have less than optimal circumstances standing between you and your goals. You may feel that some external issue has to resolve before you can move forward. You may think that you have to wait to take action. One of “the secrets” of successful people is that they move their goals forward, even when their circumstances are not ideal. Successful people do not allow outside circumstances to be an excuse for inaction. I’ve come to realize that the obstacles I thought were holding me back were NOT obstacles at all. They were my life. I learned that I must take action and move forward, even when life was throwing me curveballs. No matter what you are facing, you can take some small action today to move your goals closer to reality. There will be no better time than TODAY to take your first step. No matter the circumstances, we can take some small action to START. The human brain is not wired for success. Our brains are wired for survival. Our mind tricks us to keep the status quo. When your brain perceives change, it is on high alert for danger. That is why there is such power in taking the first steps towards a new goal. No matter how small your initial step is, it is SIGNIFICANT. You harness incredible power when you decide to crush inertia and move forward in a new direction. You begin to reprogram your mind. You begin to create a new comfort zone. You begin to build a new life. Write 1 BIG GOAL for 2015. Identify 3-5 STEPS to accomplish that goal. 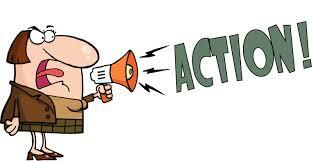 TAKE 1 ACTION in the next 24 hours to move your goal forward. You will create momentum that will feed upon itself. You will gain traction. You will make progress that you never imagined. We can not wait for perfect conditions. We have to have the courage to take the first step – TODAY. Standing still and waiting is AVERAGE. Having courage to take action is REMARKABLE. This entry was posted in Life, Mind Set, New Beginnings and tagged action, average, blog, Goals, high achievers, human, inertia, Joe Ciccarone, move forward, Pope Paul VI, remarkable, significant, status quo, Success Magazine, take action, The Secret, Theodore Roosevelt, Today. Bookmark the permalink. 1 Response to Take Action! Great article Joe . Love …”our brains are not wired for success , we are wired for survival. “Success is proactive and not passive.